Undefeated American boxing champion Floyd Mayweather Jr. is unsure if his May 5 opponent, Miguel Cotto of Puerto Rico, has truly “recreate” himself as a boxer. The Mayweather vs Cotto fight will be o May 5th at the MGM Grand in Las Vegas. Mayweather will challenge Cotto for the World Boxing Association junior middleweight championship this Saturday in Las Vegas (Sunday in Manila), the first time since 2007 that he will fight at the 154-pound division. 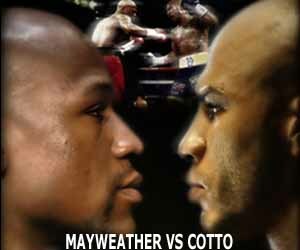 “I can’t really speak on it, if he really reinvented himself,” Mayweather said in a Boxing Scene interview about Cotto. Cotto’s career was at a crossroads following his 12th round technical knockout loss to Filipino champion Manny Pacquiao in 2009, but was able to bounce back by moving up in weight. He then won the WBA belt and has successfully defended it twice. Last December, he made a strong statement by defeating Mexico’s Antonio Margarito, the only other man to defeat him. Mayweather notes that he has already fought another fighter who has supposedly “reinvented” himself. “Last time they said a guy reinvented himself was Shane Mosley, when he beat Antonio Margarito,” Mayweather said. “Then, after I beat Mosley, they said he was over the hill,” he added, referring to his May 2010 unanimous decision victory over “Sugar” Shane. Despite this, Mayweather insisted that he has no plans to underestimate Cotto. “He’s a solid guys, he’s strong, he’s tough and he’s a guy I can’t overlook,” the undefeated boxer said.